A distinguishing feature of William and Mary's Chemistry curriculum is its undergraduate research program. Guided by and working one-on-one with a member of the faculty, our students take on real research problems in the lab and experience both the challenges and deep rewards of scientific investigation at the highest levels of professionalism. All fifteen full-time Chemistry faculty members participate actively in the undergraduate research program. Descriptions of each member's projects can be found under Faculty Research Areas or in the faculty directory. Typically, undergraduate researchers begin their investigations in the junior year; however, many students start earlier. Our Chemistry undergraduates co-author research papers which are published in leading scientific journals and participate in numerous presentations at professional meetings. The majority of research support comes from external grants and contracts awarded to our faculty from a variety of state, national, international, government, and private corporate sources. About 80-90 percent of our majors usually participate in independent or Honors research in their senior years. Ten to fifteen senior students each year complete the departmental Honors research program, which involves submission of a mini-thesis and oral defense. In recent years, more than 60 percent of those accepted into medical school have participated in senior research projects. Additionally, Chemistry research students participate each spring in the Undergraduate Research Symposium and present their accomplishments to other students and faculty of the physical, biological, computer, and mathematical sciences. 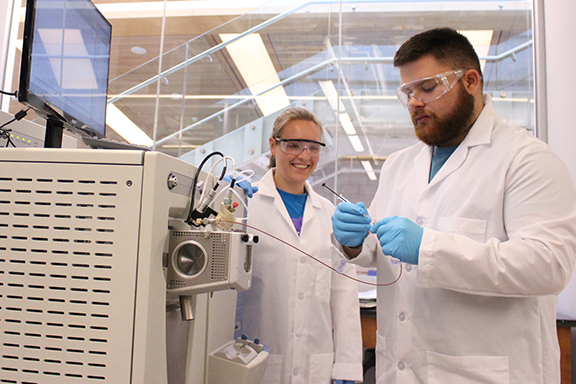 The Chemistry department supports the full-time research efforts of 45-55 undergraduate chemistry majors each summer through internal and external funding. Students are provided with a ten-week stipend and with free dormitory housing. All members of our faculty participate in the summer research program. Summer research students are expected to present the results of their summer research at the Undergraduate Science Research Symposium.